What should have been an ordinary morning is about to spiral into a day of unrelenting terror. As a reporter for his high school newspaper, Tom is always on the lookout for an offbeat story. But from the moment he woke up this morning, his own life has been more bizarre than any headline could ever tell. The streets of his town are suddenly empty and silent. A strange fog has drifted in from the sea and hangs over everything. And something is moving in that fog. Something evil. Something hungry. Closing in on Tom. Tom’s terrified girlfriend Marie says the answers lie at the Santa Maria Monastery, a haunted ruin standing amidst a forest blackened by wildfire. But can he trust her? A voice that seems to be coming from beyond the grave is warning him that nothing is what it seems. 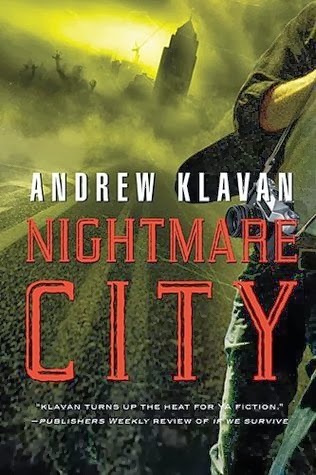 Only one thing is certain: with his world collapsing around him, Tom has only a few hours to recover the life he knew—before he, too, is lost forever in this nightmare city. This is the first book I've read by Andrew Klavan and I look forward to reading more. I've been looking forward to this book for sometime. I like to mix up me reading with a bit of suspense, mystery, and darkness. This book gave me that and more. The story kept me turning the pages and it was hard to set down. Tom was an interesting character to follow as he tried to figure out what was going on around him and why it was happening. He also was a teenager and the way he was portrayed was great. I've had issues with other books where kids are the main character, but they didn't act their age, here, Tom acts his age and it was really enjoyable. It takes time to figure it out and the answer isn't just handed to him. I've never been a horror fan...or even things jumping out and yelling boo fan. So, a few times in this book, I jumped, especially when the figures in the fog appeared, but it didn't take away from the story for me at all, it made me want more answers to why are they there and why is Tom the only one around? Andrew Klavan is a best-selling and award-winning thriller novelist whose books have been make into major motion pictures. He recently broke into the YA scene with the best selling Homelanders series, starting with The Last Thing I Remember. He is also a screenwriter and scripted the innovative movie-in-an-app Haunting Melissa. Thank you to Thomas Nelson/ Zondervan and Litfuse Publicity, I won this book as a prize, I was not required to post a positive review.